The Phoenix Suns have really stepped up in my book. 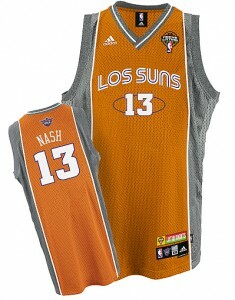 Tonight in their Game 2 against the San Antonio Spurs, they will wear their “Los Suns” jerseys to protest Arizona’s ridiculous new immigration law. Having lived in Phoenix for three years I know firsthand what the racial climate is like there. And it aint pretty. I was stopped for speeding and only after the officer saw my Spanish last name on my license did he ask me for my social security card to prove I was a citizen. They do NOT ask white people for that. Sure, the game is being played on Cinco de Mayo but the Suns have made it clear that this gesture is a protest against the Arizona law. So tonight, when the rest of the nation is watching the game I do hope that the announcers mention why the Suns are wearing those jerseys. And I hope it goes beyond Cinco de Mayo.